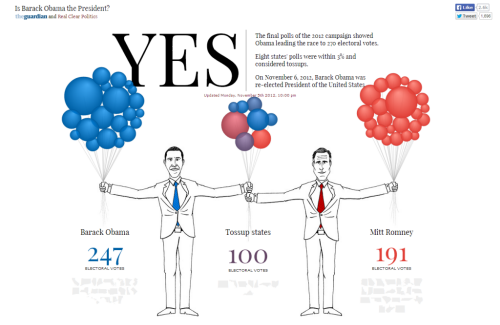 The word infographic has become a part of the lexicon used to describe information delivered using graphics. 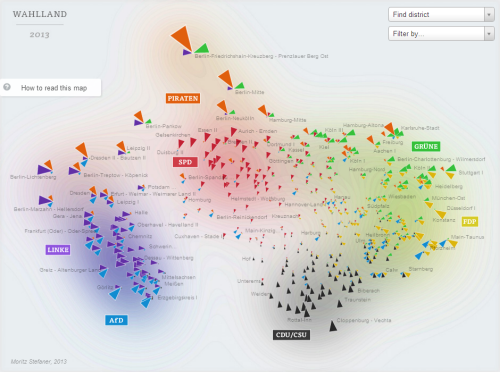 Maps have always been information graphics and although this example is described as an infographic it’s actually a map; an abstract, interactive web map, but a map nevertheless. It deals with spatial information and organises it in a manner that assists the communication of the message the author wishes to impart. Lemos shows the distribution of the population of municipalities in relation to the capital of each Brazilian state. It illustrates the urban hierarchy too in a clean, efficient graphical manner. 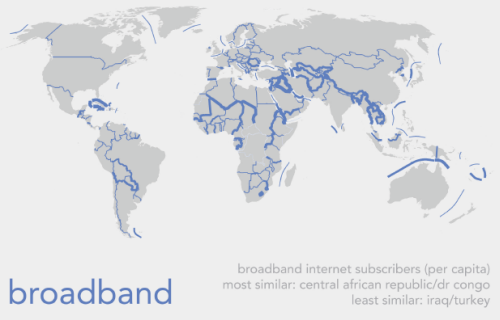 It’s a cartogram that dispenses with the real geography in favour of a version that ignores everything except the crucial aspects…population sizes illustrated as proportional symbols, organised in a linear fashion, by state. The map’s use is supported by a simple yet elegant functionality including data display returned via a hover rather than a click. You can zoom to disentangle the symbols giving clarity to each spoke of the map. Transparency is well used and gives a sense of density. Simple. Effective. Enthralling and informative. 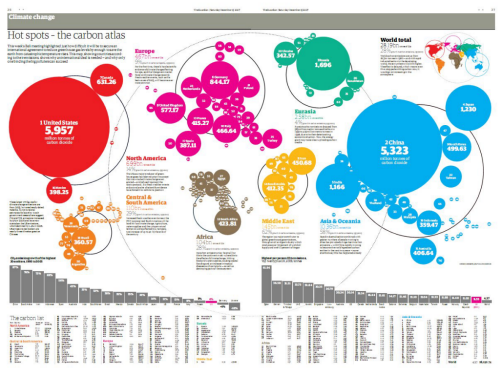 Maps do not need to be graphically complex to impart their information but they do need to be engaging. 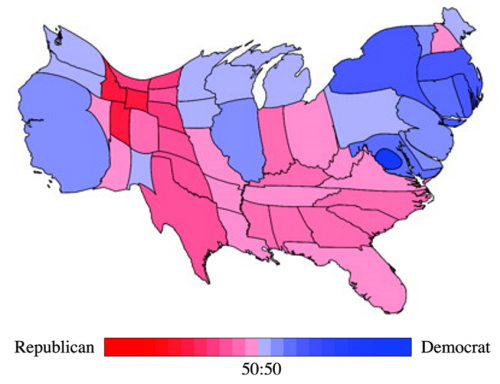 Cartograms seem to be one of those map types that garner polarised opinion. There are as many who find them compelling and highly useful as there are those who find any reason to debunk their utility. 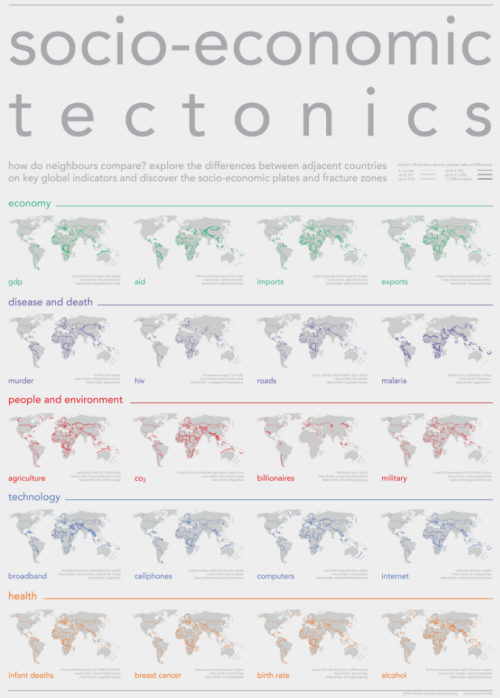 The WorldMapper project, a research project spearheaded by Danny Dorling and Benjamin Hennig have done much to bring the value of the Gastner-Newman cartogram, in particular, to global attention. 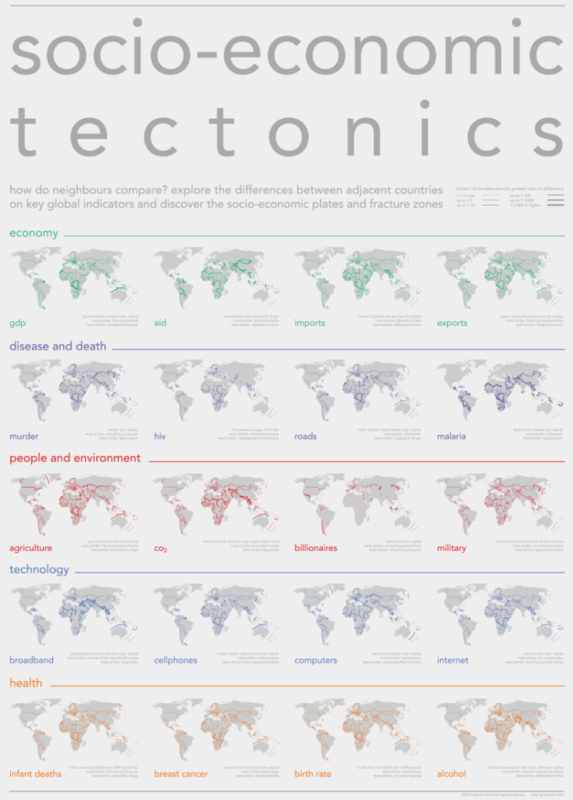 Taking a range of global indicators, they have produced well over 200 maps showing all manner of socio-economic indicators that illustrate global inequalities. The web site allows individual maps to be seen and also downloaded as an executive briefing document combined with brief notes, graphs and other allied information. There’s even a published book of the maps. 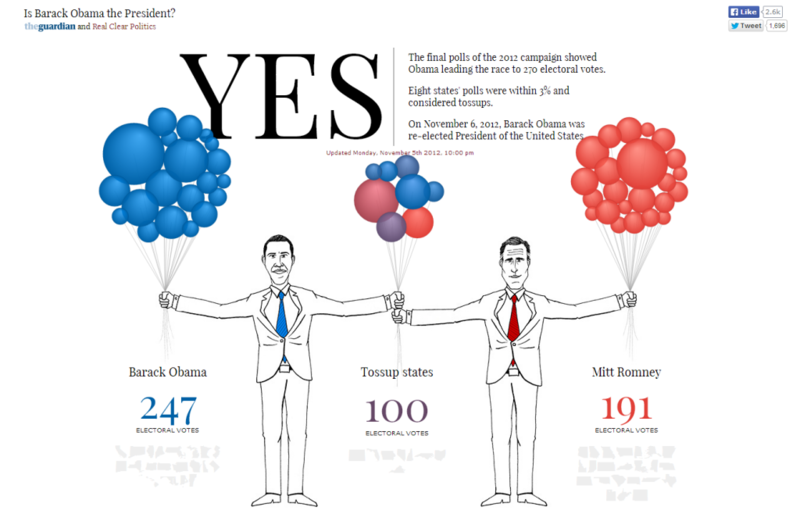 The maps rely on the cartogram to deliver the message. Only colour is added to help identify the different continents and to anchor the eye. Hennig has gone further with the idea and developed a variant he calls a gridded cartogram. While a conventional gastner-Newman cartogram modifies the size and shape of an area relative to a mapped value, the gridded version incorporates additional detail so that individual grid cells are morphed according to relative internal quantities. The result is a display of internal heterogeneity that the standard Gaster-Newman approach does not support. A great example of the use of cartograms and the development of further cartographic research. 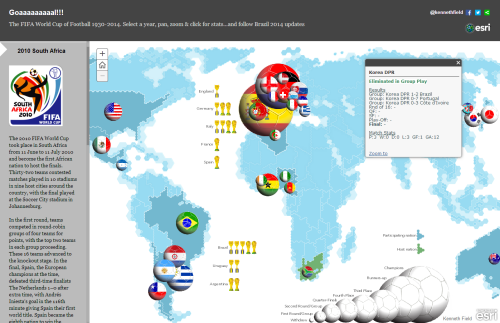 More details on Worldmapper at the web site here. 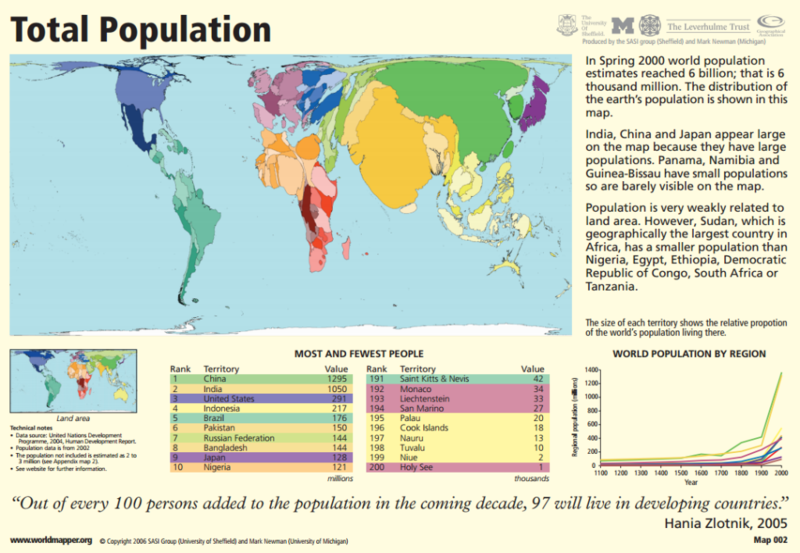 Details of the gridded cartograms are on Benjamin Hennig’s research page, Views of the World, here. There’s a world of difference between designing maps for inclusion in small format publications which are designed to be viewed at about 18 inches and a large format poster designed to catch the attention of someone as they pass by, perhaps fleetingly, in a gallery. This map was designed for the latter, the original being A0 size. 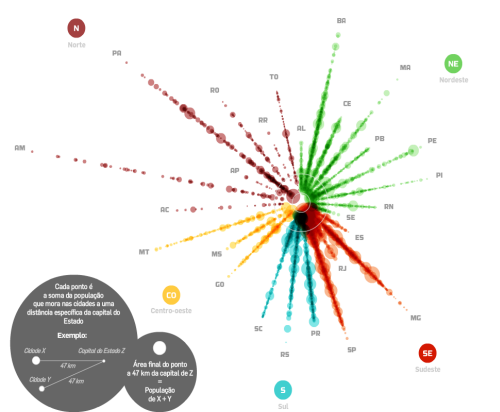 The poster displays the global distribution of national professional football teams. 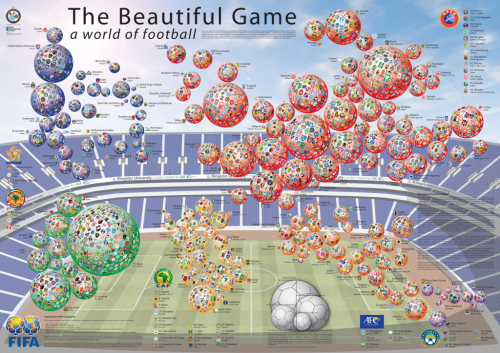 The use of a Dorling cartogram technique scales the symbols to the number of professional teams in that country. The cartogram neither maintains topology, shape of feature centroids yet we are still able to pick out that it’s a world map since most adjacent countries touch each other. 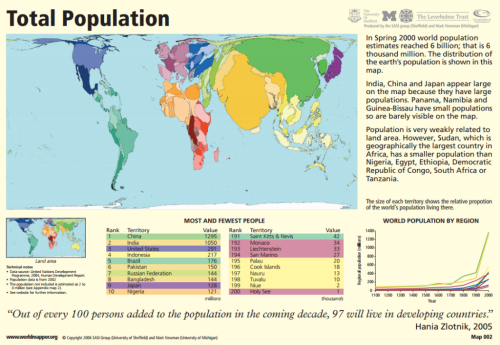 The map could have been presented using a choropleth or some other standard mapping technique but when you want maximum visual impact you need to design something far more eye-catching. The entire symbology of the map is football related from the football sphere symbols that also contain team logos to the background of a football stadium. From a distance the football symbols seem to drop or dance about inside the stadium cauldron. National football association badges locate countries and symbols are grouped into FIFA confederations. The poster is designed to offer more than simple visuals though; it provides readers with a way to explore the structure of the game as well as the etymology of the term ‘football’ itself and how it varies globally with different vernaculars. It deliberately uses saturated, vibrant colours that would not necessarily work for other presentations and in total it’s quite a visual assault on the eyes. Subtle it is not, but maps do not have to be subtle to be effective depending on the viewing environment. It won a few awards which is why it gets a mention in MapCarte. I even managed to add a little version of me sat in the stands just for fun. You can view the web map here or download a copy of the full size print map here. A lot is currently being made of personalised geographies and maps that reflect our supposed desire to see content filtered in some way by what map-makers think we might want to see. Google are pioneering personalised content in Google Maps based on our search histories and other preferences. 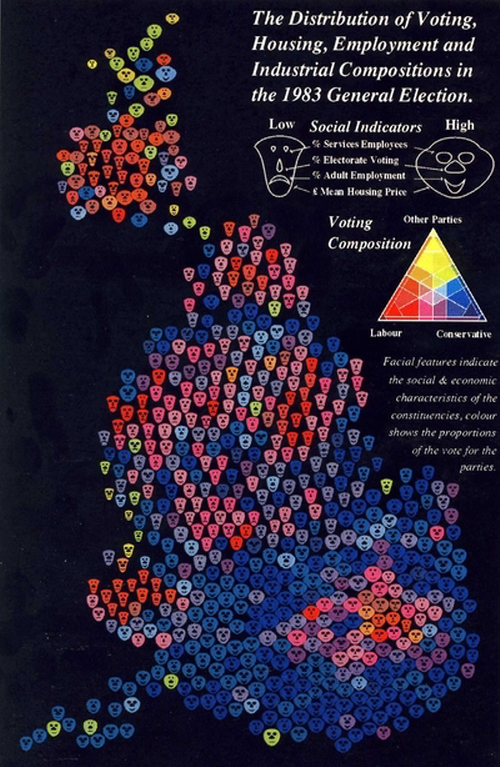 But there’s always been a far simpler way of understanding personalised geographies. Sometimes these are as basic as a world map in a pub where patrons are invited to place a pin to show their location…thus the map of the pub’s patronage takes shape. We may even have a map at home in which we place pins to show where we’ve been. The Guardian, in collaboration with Kiln have created a simple application that allows us to create our personalised world of travel. The map requires you to input the countries you have visited and the number of times you’ve been there. It’s a simple interface to add your information and the map is then built. What this app does very well is not just default to a shaded choropleth but turn the data into a density equalizing cartogram. 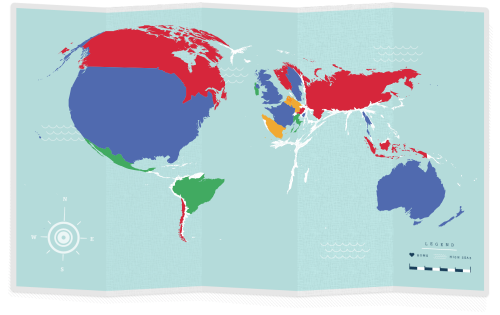 Countries visited are shown proportional to each other in size. The map is then presented as if on a folded piece of paper with a nicely constructed layout. You can print your map or share it. Of course, what’s really going on is The Guardian is collecting data through the choices of our selections which is possibly the real purpose of the map. They still achieve that aim by making the application interesting, simple and designed to encourage participation. Simple. Fun. Eye-catching. 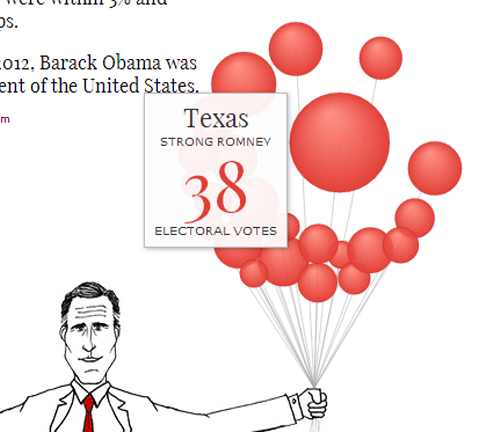 Visit The Guardian’s web site here to make your own personalised map.